'Tis The Season TUBA Jolly! Tuba artist Jim Self has put together the best tuba players and arrangers in Los Angeles to play 12 part arrangements of 20 of the greatest holiday songs played on Santa’s favorite instrument – the TUBA. 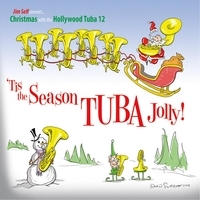 `Tis the Season TUBA Jolly is a new jazzy Christmas CD featuring the unique sound of 12 tubas playing arrangements of 20 of the greatest holiday songs played on Santa’s favorite instrument – the TUBA. Hollywood studio and orchestra musicians and 18 great arrangers are featured. visions of sugarplums dance in your head. This is Christmas music you can really “feel”.